A Euro Breakout Against The Dollar: Or False Alarm? The market for EURUSD during last Friday, i.e. January 25th, 2019, saw the Euro stage a strong bounce that has led to questions over the validity of the recent the breakdown that commenced on January 10th. Therefore, the question to ask is are we in a period of market “Déjà vu”, i.e. the Friday pattern is typical EURUSD behaviour. Or, are we about to see the Euro mount a major move higher after it the 15-day decline drew in the weakest longs who may now be smacked hard by a Euro recovery? The chart above maps out the corrective channel that saw EURUSD tear lower through several technical supports. It had seemed that 1.1355 would hold as on the 6th and 2nd/23rd. After that there was a short-lived capitulation to 1.1289, before the bounce on Friday. 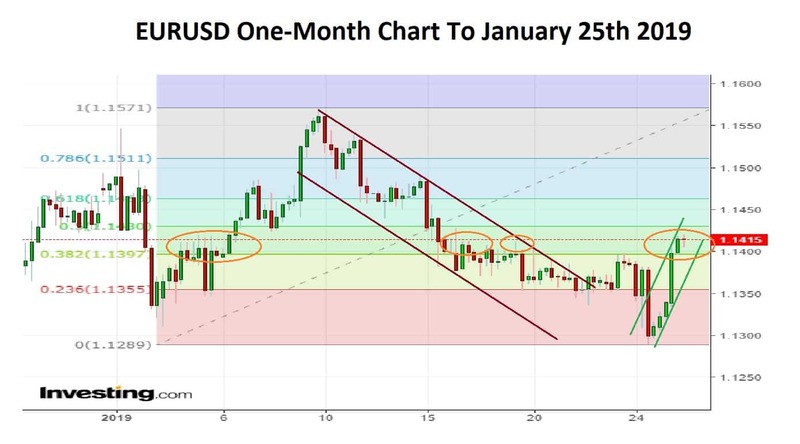 The chart also features four orange ovals at the 1.1397 level that have been a resistance area on four occasions in the past month …not that it was able to resist a Euro rally very well in early January. So, are we at that level again, ready for new Euro strength? Or will the Friday close be a form of high-water mark as during the third week of the new year? The technical mood is bullish to neutral for the first moments on Monday trade and should remain that way for the week. Thereafter, the mood appears to be swung back in favour of the Dollar, albeit from an oversold perspective as against an outright buy. Therefore, one may conclude that as this year is underway the trading mood is to job back and forth and scoop up profit when one is able to make a decent return as against becoming wedded too much of a strategic position. Range watching maybe how we paly these markets for now and one should note that the three-month percentage range is currently at the lowest level since 2014. Now, one cannot take too many signals from that as a real pointer as to medium-term direction. Instead one should take it as a reminder that last week’s action could be a lure…i.e. an enticing Euro trap which ends in tears for over eager longs. I think that this is now very much a market that is made for choppy trading and whilst I am no fan of minute by minute “hockey-cokey” trading, i.e. “in, out then in and out” looking to exploit small surges and retracements would appear a good option. The central banks will play a big role in determining the direction of EURUSD. The Fed began the balance sheet reduction in October 2017 after it had tipped the scales at over $4.5 Trillion. Wall Street has worried that the operation was adding to market pressure stemming from a series of interest rate hikes that began in 2015. This has been Dollar neutral as the rate increases were well signalled but the lack of Dollar asset buying undermined greenback demand. In contrast the ECB last week acknowledged that economic growth in the Eurozone was likely to be weaker than earlier expected given exogenous affects from factors like China’s slowdown to Brexit. The region’s economy is suffering its biggest slowdown in half a decade. This has to pose questions over whether the ECB will be able to increase interest rates for the first time in a decade later this year as its current guidance indicates. One must think no it will not. Longer-term, I favour the Dollar, however as the new week begins, I will go long Euro but be happy with a small return in the midst of choppy trading and mixed central bank messages.